The idea about add a QR code to the CV is not new ( i did it few month ago). In my case, i used to link my QR code to my linkedin profile. But, i recognize that linkedin is not visually attractive, worst in a movil phone. Today I’ve read about this application which makes my details more “atractives” than seeing them in Linkedin. I’ve thought is a good option to link the code and i’ve wanted to share it with all of you. The tool is presented: “… You can create your business card online QRecognize.me and use with any mobile phone in order to share your contact information with your staff QR code. Put your QR code in your corporative presentations and shares all your details easily with your audience. Improves your ‘personal branding‘ and get your customers to remember you”. I think it looks good and profesional. What do you think about it? 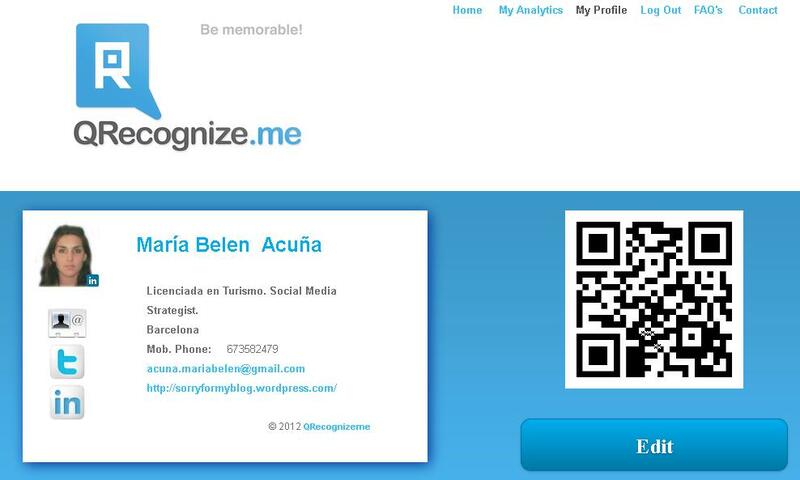 Esta entrada fue publicada en Marketing Online y etiquetada personal brand, qr codes. Guarda el enlace permanente. Really cool. I have just signed up for it and got shocked with the Analytics module, now I can track the impact of my conferences! Pedro, thank you for your comment! I didn’t prove the analytics yet, but after your words I am really excited to check it out and begin to see the results!